Journey To Space has been so popular at IMAX theaters and science centers all over the country that Shout Factory has decided to release it on Blu-ray. Narrated by Sir Patrick Stewart (Star Trek), Journey to Space offers spectacular space footage and gorgeous views of Earth. This dazzling film shows the magnificent contributions made by daring space pioneers, and illustrates how exciting and ambitious NASA’s next era promises to be, including space travel to Mars and capturing asteroids. My oldest daughter is really in to space and my husband and I were really excited to share this film with her. She immediately took to it – and keep in mind, she is just (almost) 5 years old. We have watched it several times already and she has now decided that she wants to be an astronaut when she grows up. Brilliantly narrated by film and television legend Sir Patrick Stewart, Journey To Space gives a sweeping overview of humanity’s accomplishments in space, as well as our ongoing activities and future plans. Journey To Space puts into historical context the magnificent contributions made by the Space Shuttle program and its intrepid space pioneers. It uses the most spectacular space footage – including unique views of Earth and operations in space – such as deploying and repairing the Hubble Space Telescope. It then goes on to show how the shuttle launched and assembled the International Space Station (ISS). Together, these programs have taught us how to live, build and conduct scientific experiments in space. The ISS will continue operating in space until 2024, and the film shows how it is building a foundation for the next giant leaps into space, concluding with a fascinating, realistic scenario of how astronauts will actually get to Mars, live there for long durations, and then return home after a two-and-a-half-year mission. Purchase here. Enter to win a copy of Journey to Space on Blu-ray using the Gleam form below. 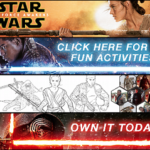 There will be THREE (3) lucky winners! While you are here, be sure to check out my other giveaways and GOOD LUCK! I really want to try the growing a plant on Mars one!! Super fun and my son is amazed by anything that grows! I'd like to do the experiment on growing plants on Mars with my grandkids. My son would like to do the How To build A Space Station experiment the best. My grandkids would like the building a space station. Learning about the differences in our atmosphere and Mars would be interesting. What would a martian look like sounds fun. I would love to try how to grow a plant on Mars. My class would get a kick out of this. What would a Martian look like...I think my grandson would enjoy this. The Space Station would be fun to do with my grandkids. My grandson would like these, especially building a space station. What does a Martian look like? I think this would interest my grandkids. 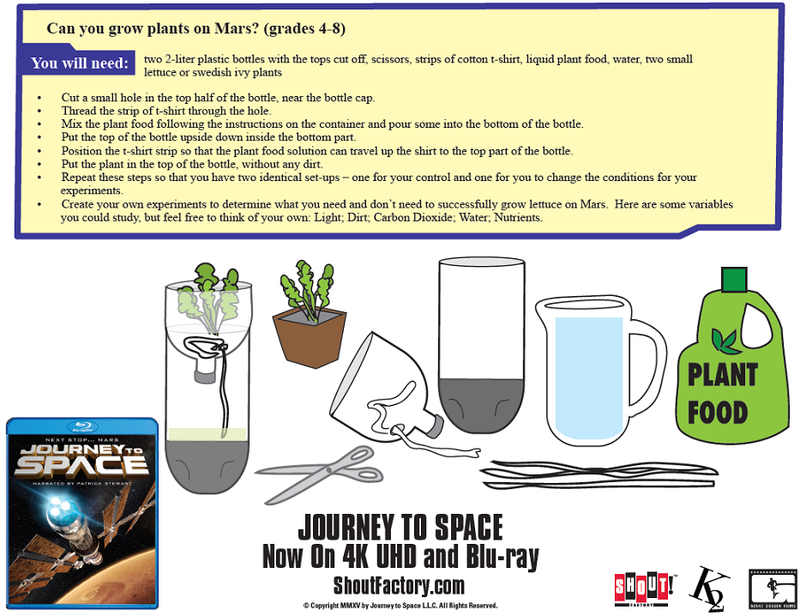 My grandson would pick the higher grade level one and try to grow plants on Mars. My grandson would enjoy building a space station. I would like to try the Can You Grow Plants on Mars Experiment. My granddaughter would enjoy the Can You Grow Plants. My girls loved that one! Seeing how Earth's atmosphere is different from Mars would be a good experiment for my grandson. I would try the growing plants on Mars with my daughter. What does a martian look like would be fun to do with the grandkids.